Book reviews and other interesting goodies. "The DFZ, the metropolis formerly known as Detroit, is the world’s most magical city with a population of nine million and zero public safety laws. That’s a lot of mages, cybernetically enhanced chrome heads, and mythical beasties who die, get into debt, and otherwise fail to pay their rent. When they can’t pay their bills, their stuff gets sold to the highest bidder to cover the tab. That’s when they call me. 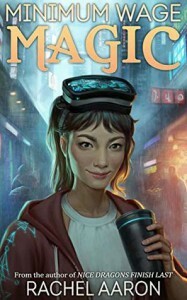 My name is Opal Yong-ae, and I’m a Cleaner: a freelance mage with an art history degree who’s employed by the DFZ to sort through the mountains of magical junk people leave behind. It’s not a pretty job, or a safe one—there’s a reason I wear bite-proof gloves—but when you’re deep in debt in a lawless city where gods are real, dragons are traffic hazards, and buildings move around on their own, you don’t get to be picky about where your money comes from. You just have to make it work, even when the only thing of value in your latest repossessed apartment is the dead body of the mage who used to live there." An entertaining and fast paced romp!